If you’re like us, you bring your lunch to work when you’re trying to save money, meal plan for healthier eating, or to be more eco-friendly and avoid all of those takeout containers. If you want to do those things, plus maintain a professional look — even if you’re just eating at your desk or on a park bench — we’ve rounded up a variety of stylish office lunch containers. 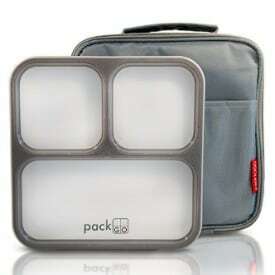 We’re featuring adult lunch boxes, bento boxes, ice bags for keeping your lunch cool, insulated storage that will keep cold things cold and hot things hot, reusable storage bags and food wraps, and more, including the Mr. Bento Lunch Jar Set pictured here — along with a restaurant that serves takeout food in reusable bowls. Readers, how often do you bring lunch to work? 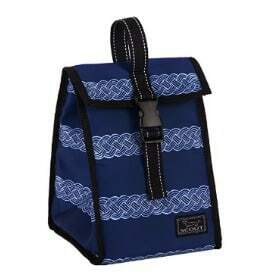 What are your favorite environmentally-friendly and stylish office lunch containers? Compared to brown lunch bags, Ziplocs, and individually-packaged food, what swap do you think makes the biggest impact environmentally? What is the easiest swap to make? Psst: You may want to see some of our older tips on saving money on lunch at work (even if you’re eating out all the time), what to eat when you have no time to eat lunch, and the best snack ideas for work. So start thinking about all of the meals you could take to work and how much waste you could save by making just a few changes to your routine with these items. 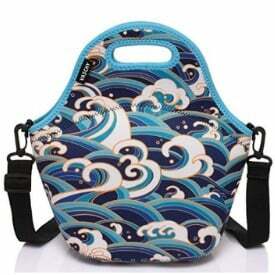 Or, if you have your own lunch accessories that you swear by, feel free to share with us in the comments! 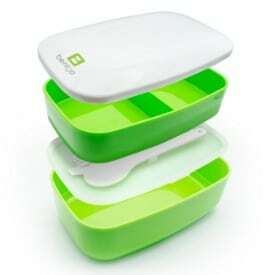 We’re loving bento boxes for their minimalist look. 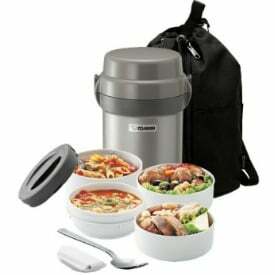 Plus, most of them are stackable and great for meal planning when portion control is one of your priorities. 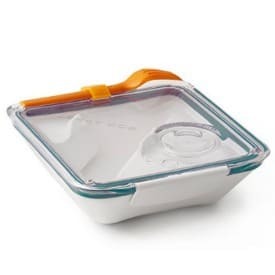 Several of the containers even come with flatware, so you won’t find yourself needing to keep a box of plasticware in your desk. 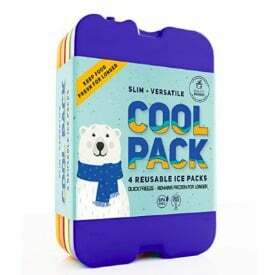 Whether you have a long commute, don’t trust your coworkers when it comes to the office fridge, or if there simply isn’t room for your stylish lunch bag without having to take out all your perishables when you get to work, here are a couple ice pack options –both a smaller one and a larger one — with good reviews. 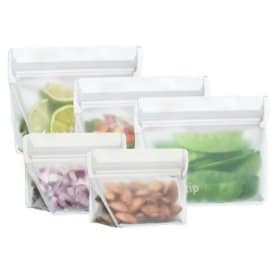 If you find yourself using too many plastic baggies and don’t really want to rinse and clean something that’s already fairly flimsy and meant for a single use, check out these reusable baggies and food wraps. Many restaurants, including office cafeterias, obviously offer reusable plates, cups, and silverware if you’re dining in, but if you live in one of the markets with Just Salad — Chicago, New York, Philadephia — note that they have reusable bowls for all orders, even takeout. Other restaurants in Durham, N.C., San Francisco, Portland, Oregon, and Brooklyn are starting to promote reusable take-out containers, as well. In April 2018, the City of Berkeley even proposed a tax on disposable take-out containers. Finally, if you need to use a straw, consider bringing your own. Many options for stainless steel, silicone, glass, and other reusable materials can be found on Amazon. 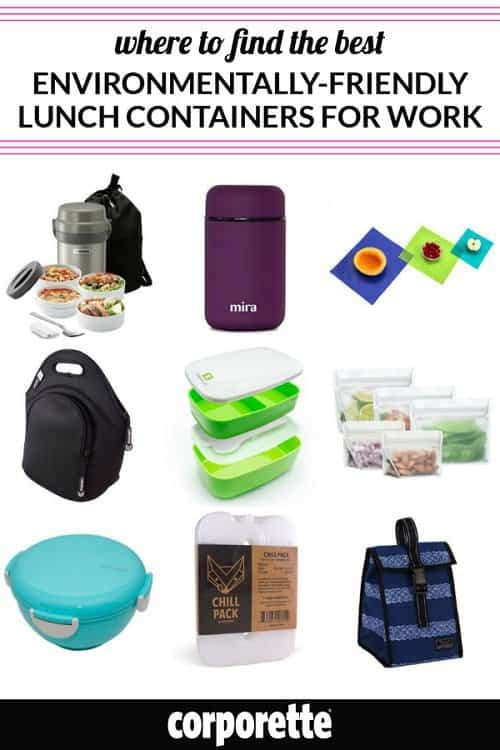 If you already use or decide to buy any of these stylish office lunch containers, or if you have other suggestions on what you already use — or if it even matters to you if you lunch bag looks professional or whether you’re still rocking a Fraggle Rock lunchbox you found at a thrift store — let us know what works for you! 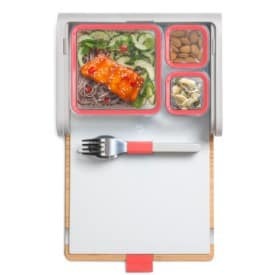 My favorite lunch container is a DIY bento made of a large square glass Snapware container subdivided using silicone muffin cups. PB Kids used to sell packable flatware in a little plastic carrying case. Has anyone seen anything similar for adults? Yes, at the Container Store! They have plastic cutlery sets(Including chopsticks!) in a plastic case as well as a stainless steel set in a plastic case. You can find them by searching “utensils”. I pack lunches for myself and my kids. 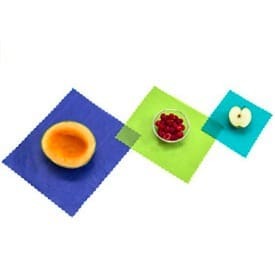 We use the LunchBlox system for all 4 of us, as well as some reusable snack bags from Bumkins. Also look into the Thermos Foogo containers. Holds soup really well without spilling. Any recs for reusable silverware? The bamboo sets on Amazon seem to split within a few months. The plastic on the Sistema set got weird after too many days of my kids not rinsing it off after the tomato soup lunch. I’d really like a stainless steel set but I worry that would get mixed up with the “hot lunch” options at school and be lost forever. Anyone have a set they particularly like? I have some from Target a few summers ago. They’re plastic, definitely not stainless steel. They come in a variety of bright colors. I’ve washed them in the dishwasher every other night for two years with no problem. They probably came from the outdoor/picnic section at Target. We send our regular stainless forks and spoons and they come back 98% of the time. My kid packs them back up with the rest of the containers and puts them in the lunch bag. If he’s bringing his lunch, he’s not also getting a tray for hot lunch so there’s not much risk for confusion. Maybe find a cheap set at a discount store and try it. We do the same thing. We got a new set of silverware recently and I saved the old set to send with my kids for school lunch. They make it back most of the time, but if not it’s not a huge deal. I buy silverware from Salvation Army for my lunches exactly for this reason. Sometimes they fall out of my bag when I am getting in and out of the car and sometimes they end up in the lunchroom cache. I also have a metal travel spoon/fork combo utensil that I try to keep in my purse. I have a travel stainless fork, knife, spoon set with a neoprene case that I bought off Amazon. Check out Roaming Cooking. It looks very similar. My stepdaughter recently totalled the car she was driving (her sister’s). She has since been removed from car insurance, and isn’t driving at all right now. I believe her license was suspended since she’s 16, but I’m not 100% -has a court hearing later in June. Apparently people in her city in SEUS take Uber and Lyft everywhere anyway, so it hasn’t been a problem yet. I absolutely think it’s fair to ask her to contribute. Driving is a privilege, not a right. Well, this is not just going to be a daughter problem. It’s also a mother problem. Are you currently paying above-and-beyond for insurance, and the father wants to stop paying that amount? Or are you assuming insurance costs will increase and the father will be asked to cover part of the increase? I’m all for teens getting jobs and investing something of their own labor into driving, but surely this gets complicated, since the girl lives with her mom, and the mom would need to be the one making sure the kid’s job happened and continued to happen? I think it’s reasonable to ask a teenager to contribute to their car insurance, whether or not she’s had a car accident. I’m not sure how much control you and your husband have here though, if he’s not the custodial parent, and he would end up paying more in child support if it were disputed (presumably, he’d pay at least enough for the mom to pay for insurance out of the increase). Whatever you decide, I encourage you and your husband to make sure this about your step-daughter and her safety and responsibility, and not about any disagreement with your step-daughter’s mother. It’s very hurtful for kids to feel like their parents care more about an argument with the other parent (or money) than about them. This is something your husband and his ex wife need to work out without your help. At least in the two states I’ve lived in, you insure cars, not the drivers. Perhaps that’s not the case everywhere? Particularly for a minor without a car in her name, I assume the car insurance will be going up regardless of whether she’s added back as an authorized driver or not. But in general I don’t think there’s an issue with minors being expected to contribute to car insurance costs. That is most definitely not the case everywhere. I even wonder if it truly is the case in your two states. Which ones are they? From what I know, you insure both – liability portion covers the person and collision/comprehensive cover the vehicle – typically you have to have both in the insurance policy. Thinking through this, while you can be a licensed driver without needing insurance, in my state you cannot own a car without insurance and the insurance rates very much depend on the driving record of anyone in the household. If you want any particular driver in your household to be excluded from your rates, you can do so but they are specifically called out as uncovered on the policy documents. So yes, you are insuring the car, but you can’t drive an uninsured car. I didn’t have to pay as a dependent. The caveat was that if we were responsible for anything that increased the cost of insurance, we needed to pay the difference. I did goof and this did kick in, but once it came time to renew, I switched companies and started paying a lot lower amount. I totaled a car when I was 16. I had been paying for that car to be insured, so when a replacement car came along (it was a while), I paid to insure that too. I didn’t have my license suspended so I’m the interim, I was on my parents two cars and paid them the increase. My insurance was something like $2500/year. It’s possible I paid half and my parents paid half- this was like 1999 so the details are fuzzy. When I went to college the car went to part-time driver status and I know I paid 100% of that. Rosa also smashed up my Dad’s 2003 Mercedes driving to school. She said it was b/c a car cut in front of her, but no one was there to see it. Dad told her she would not be able to drive any car to school any more. I always wonder what the real story was. Personally, I was a good driver, but decided NOT to drive once I went to college in DC, b/c I did NOT need a car, and did NOT want to drive a car back and forth to LI, preferring instead to take the SHUTTLE, where they had SOOOOO many magazines to read. Now that I AM BACK in NYC, I do NOT drive, b/c I do not need to and it is VERY expensive to keep a car in NYC. Myrna pays over $600 every month for parking! FOOEY! And her car is 3 block’s away so she has to walk to get to it! DOUBEL FOOEY! When I move to Chapaqua and get MARRIED, I will get a SUV to drive my kid’s around, like Rosa does, but I need to find a guy first. At this point, no man is interested in doing that with me. I am confused why that is, but Grandma Trudy says do NOT compromise my ideal’s just for a ring. I agree. I am strong and I expect to find a man who understands me and will love me for who I am. I will NOT be a “yes woman” just to have a man. Besides my experience with my ex, drinking and then expecting me to take all my clothe’s off when I got home for him, is NOT acceptable. TRIPEL FOOEY on men who expect to do this with their wives after a long day at work! please, please do not mention anything about child support amounts to your stepdaughter when discussing this. kids don’t get to decide those things and it will come across as though you resent her. ask me how i know. Follow-up question from this morning’s thread, the discussion regarding screen time. Many commenters mentioned they notice behavior patterns in their kids when the kids have had too much screen time. Have you noticed the same thing in yourself or other adults? Do you start to act differently? I’ve realized that I seem a little more internally restless/jumpy. And my attention span is lower. I’m not sure I’ve noticed other behavior. Heck yes. There is a dramatic difference for me. I am zen-calm by Sunday night after a weekend away from technology. (I don’t find my job stressful – it’s just being on a computer all day that bugs me.) 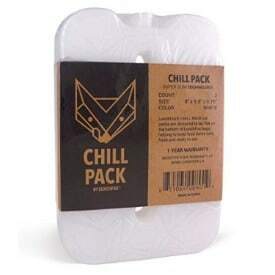 Monday evening I’m still pretty chill, but by Friday I’m irritable, short-tempered, strung out. I think it’s all the quick flipping between windows and screens and tasks. Yes, and I’ll add to that: during certain times of the month (and during already high stress times) I’m way more sensitive to it than others. Yes, it definitely affects my attention span, and I think it makes me more cranky. I also think that if someone needs my attention in real life when I’m on my phone, I’m more likely to keep going “hang on, just a minute, wait a sec” whereas if I’m reading a book or doing a craft project it’s easier for me to shift my focus, ironically. Yes, and this is why I started subscribing to a physical newspaper and rarely check news on my phone and why I only read physical books (no Kindle or Ipads at home). I spend enough hours of the day starting at a screen at work. I have to go tell my boss that I want to take a job in order to have the job call my boss to ask for his blessing to get new organization to offer me the job. Basically, my new boyfriend wants me to go tell my old boyfriend that I want to date new boyfriend in order for me to get new boyfriend to ask old boyfriend for his blessing to ask me out. Because APPARENTLY my pretty pointed, ‘It’s not you, it’s me. I fully respect and support this office but for personal reasons I’m considering taking another job which would have fewer travel/OT demands’ conversation wasn’t specific enough. Yes, I’m sure I want this new job. They are just THAT worried about ticking off my current boss. You definitely shouldn’t tell your new boss until you have a contract in front of you – this could easily backfire in a “what if old boss says no blessing” kind of way. If this is govt, it is standard and required. Within the same government system where current boss has to approve the transfer, I understand but it’s not clear that’s the case. I did not have to do this moving from private practice to a state agency. Long shot but does anyone have a recommendation for a neurologist in Chicago? I’ve treated at Diamond Headache Clinic in the past and didn’t love the Dr. turnover and how all of the dr’s I was assigned to were not actually neurologists. I’ve seen a few neurologists at Northwestern Hospital, and while I was generally happy, I have to switch because they don’t have enough openings in their schedules to fit my needs. I currently get Botox every 12 weeks. Are you downtown or West or North of the city? Some people like Susan Rubin for migraine/women’s health (Neurology), but I don’t know if she injects botox herself. As you know, you only want someone very experienced injecting it or it can look awful. Dr. Rubin isn’t the most innovative, but she’s been around a long time. She is based in Glenbrook, part of NorthShore hospital system. I would look at RUSH – Dr. Robert Wright is well respected and a good neurologist and migraine expert. But again, I don’t know if he injects botox. But I am sure he works with docs or NP in the same department who do and can refer you. So I’d call those two and see who injects. So Botox really works for you as a preventative? Do you take anything else? How often were you getting migraines before? Migraine runs in my family. My Mom had migraine and chronic daily headache and took tryptans every day, if you can believe it. I have them, but much milder. You response to botox is fantastic. I hope that with regular botox you will be able to taper down/off of some of your other preventatives. I hear you about the side effects. Please do not keep a box of plastic forks in your desk. Buy some inexpensive, reusable forks and spoons to take to work. The ocean is full of plastic. I do keep plastic forks at my office. And honestly – I just wipe them with a napkin and use them again. It’s my germs, so who cares. 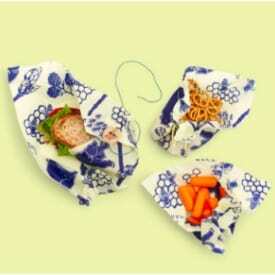 I like using the bumpkins zippered snack bags. Good for sandwiches or dry foods. Super easy to wash. 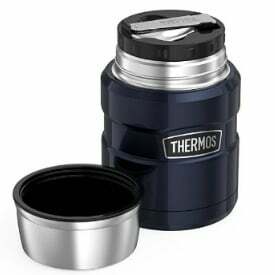 Does anyone know of any small thermos-like food jars? I’m looking for something about 1 cup in volume and shaped more like a bowl than a drinking container for my kid’s lunch. 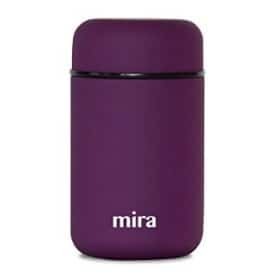 I currently use an omiebox for her and the rest of it is too big for her right now, but just the thermos part doesn’t work outside the box. I want basically the same thing but without the rest of the box! The skiphop food jar is too tall to work, except when I send soup or oatmeal for her. We have a 10 oz Thermos food jar (ours is Batman from Target). 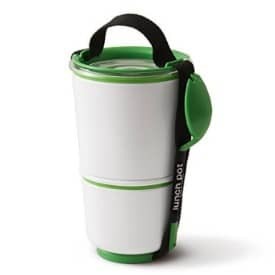 Hydroflask makes a 12 oz “food flask” that could be good for lunches. I love my other hydroflask products. Link to follow. 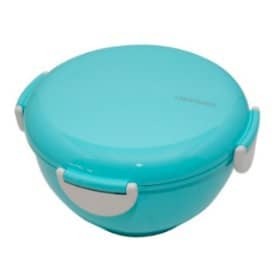 I have that Bentgo container, and it is terrible. I have been pleased with the other Bentgo pieces I bought, but that one will not stay closed without the elastic belt that goes around it. Even then, it doesn’t feel very secure. Things that are liquid (or the least bit viscous) have a tendency to leak. Also–the reusable flatware will not stay clipped into their little grooves in the lid and are so flimsy I do not think they would withstand normal use. A topic close to my heart! 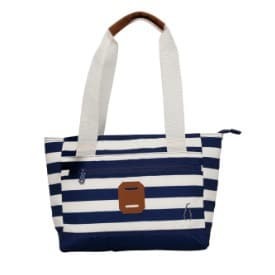 Most days I bring my lunch in a plastic bag that I have stuck inside my very large tote bag I carry to work. 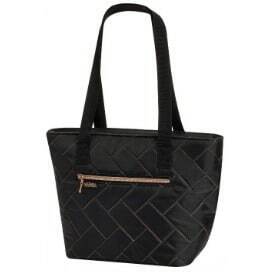 I take the metro and don’t want to worry about carrying my tote AND a lunch bag. It is lightweight and serves the purpose. I love bringing lunch. I have this secret game that I play with myself — by the end of the week, when our fridge is less stocked, I try to come up with creative things I can use to assemble lunch. For example, a few slices of bread and an avocado (avocado toast! ), a yoghurt, some nuts, cheese stick, etc. My rule is that I bring lunch to work unless I’m meeting up with a friend. I don’t have many good lunch options nearby anyways so I don’t feel like I’m missing out. I used to buy lunch every day (!) and am amazed by how much money I have saved since I stopped. And I feel much better too. It’s a fun game although yes, by the end of the week there are some odd and random pairings! 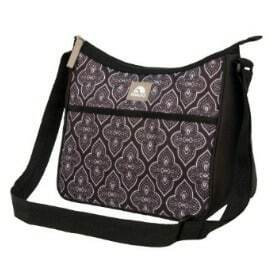 For sandwich bags — LunchSkins makes nice bags with Velcro closures. Unfortunately my school-age kid doesn’t like to use them (sigh). 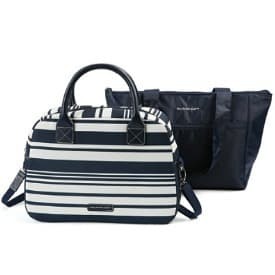 I have the Ms. Bento — a smaller version of the Mr. Bento — and it is very nice. Definitely keeps food hot. I bring lunch to work every day. My favorite environmentally-friendly and stylish office lunch containers are glass jars. I use Smucker’s Natural Peanut Butter jars – which are the perfect size and shape for all aspects – amount they hold, shape to eat out of, shape to fit into a brief case, and shape to fit my hand into to clean. I use the small size Better-than-bullion jars for condiments. I also use some wide-mouth canning jars (pint and cup sizes). I cut down bread bags for sandwiches and wraps – I thought I would get at least looks on those, if not comments, but really haven’t. If I’m out of bread bags, I use Cut-Rite wax paper… both bread bags and wax paper are usually reused several times. I don’t wash them, I just shake them out. If they get more than crumbs or something that doesn’t need to be refrigerated – like peanut butter – I throw them out. Compared to brown lunch bags, Ziplocs, and individually-packaged food, what swap do you think makes the biggest impact environmentally? Left-overs instead of individually-packaged food because there is a lot less packaging per lunch even if you are still using brown lunch bags and Ziplocs. The easiest swap to make, for me, was to glass. Glass is so much easier to pack, eat from, and wash. The hardest part was finding the best sizes of jars and of lunch box/bag. My next improvement in the lunch situation will be finding (or, if I must, making) insulating sleeves that fit the jars. 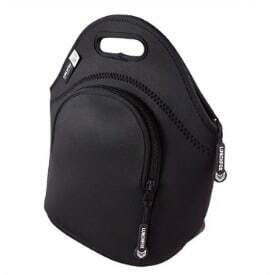 I’m thinking of something like neoprene soda can sleeves or silicone.